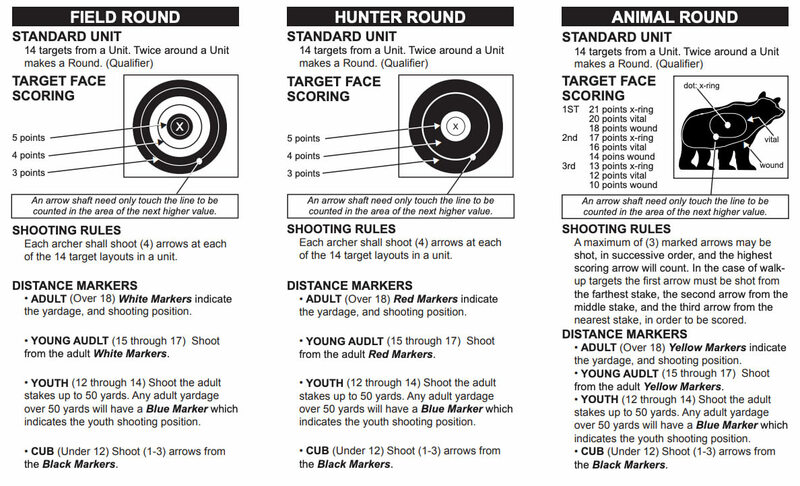 Animal Rounds use 2D paper targets with ‘uneven’ distances between 5 and 60 yards, reminiscent of the Hunter Round. The rules and scoring are significantly different. The archer begins at the first YELLOW shooting stake of the target and shoots the first arrow. If it hits, you do not have to shoot again. If it misses, you advance to the second shooting stake and shoot the second arrow, then, to the third shooting stake for a third shot, if needed. There are 3 scoring zones: Bonus Kill Zone, Kill Zone, and Hit Zone. Scoring is based on where you hit and with which arrow. The first arrow shot is scored 21, 20 or 18. The second arrow is scored 17, 16 or 14, and the third arrow is scored 13, 12 or 10. A scoring chart is included on your scorecard. Under 15, the longest distance is 50 yards. For Cubs, under 12, the longest distance is 30 yards. Please arrive at the Balboa Park Archery Range with plenty of time to register. Paper shoots may be canceled due to heavy rain (Animal, Hunter, Field Rounds). 3D Shoot is NOT canceled because of bad weather! If you would like to fill out the Membership Application and Waiver Form in advance, please click on the links below to print the forms. Don’t know your specific bow style? Check out this great chart from CBH! Posted on January 17, 2019 by archer1.